Congratulations to Dr. Daniel Jarvis, professor in the Schulich School of Education, on launching a new online resource, Crossing the Divide: Critical Transitions in Student Mathematical Development (Grade 8 To 9), designed as a support tool for teachers, students, and parents/guardians. This project is part of the Mathematics Knowledge Network (MKN), which represents a four-year, $1.4M grant from the Ministry of Education via the Knowledge Network for Applied Education Research. The MKN is comprised of four distinct Communities of Practice: Mathematics Leadership, Indigenous Knowledge, Computational Thinking, and Critical Transitions. Dr. Jarvis is serving with the Critical Transitions team under the project leadership of Dr. Lynda Colgan of Queen’s University, and he is specifically focusing on the experiences of teachers, students, and parents/guardians as students transition from elementary to secondary school mathematics learning environments. Dr. Daniel Jarvis of the Schulich School of Education is part of Ontario’s Math Knowledge Network, serving within the Critical Transitions Community of Practice team (the others being Mathematics Leadership, Indigenous Knowledge, and Computational Thinking). His work specifically focuses on the transition of the mathematics learner between Grade 8 and Grade 9. 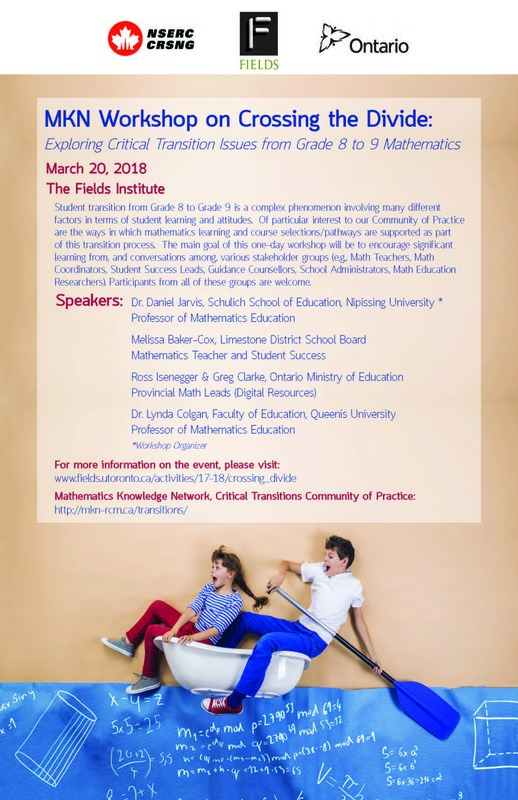 On March 20th, participants representing the Ministry of Education, university and college faculty, board level math coordinators, and math teachers gathered at the Fields Institute for Research in Mathematical Sciences in Toronto to take part in a full-day workshop hosted by Dr. Jarvis and entitled Crossing the Divide: Exploring Critical Transition Issues from Grade 8 to 9 Mathematics. Guest speakers addressed critical transition issues/challenges, shared effective board transition strategies, demonstrated provincial technology supports, and highlighted a new online resource for students and their parents/guardians. The event allowed time for small group discussions and hands-on problem-solving activities. Valuable input was also gathered from participants which will be used to direct future MKN work to be done in this area. FieldsLive archives (videos/presentation slides) available here. The Fields Institute has been selected as the host for the province’s new KNAER (Knowledge Network for Applied Education Research) Mathematics Knowledge Network (2016-2021). Dr. Jarvis will serve as a member of the Expert Advisory Panel. The Network will work with mathematics education stakeholders across Ontario to create four distinct Communities of Practice (Mathematics Leadership, Critical Transitions in Student Mathematical Development, Indigenous Knowledge and Mathematics Education, & Computational Thinking in Mathematics Education) and to provide opportunities for linking research and professional practice, with the goal of supporting Ontario’s Renewed Math Strategy (RMS). This program will be administered through the Fields Institute’s Centre for Mathematics Education (CME). As the Mathematics Knowledge Network Host, Fields will be the lead organization responsible for coordinating the collaborative activities of the network partners. This new Network includes the following partners: Association francophone pour l’enseignement des mathématiques en Ontario; Brock University; Canadian Mathematical Society; Fields Institute for Research in Mathematical Sciences; First Nations, Métis & Inuit Education Association of Ontario; Lakehead University; Nipissing University; Ontario Association for Mathematics Education; Ontario Institute for Studies in Education/University of Toronto; Ontario Mathematics Coordinators Association; Queen’s University; TVO; University of Ontario Institute of Technology; University of Windsor; Western University; Wilfrid Laurier University; and York University. 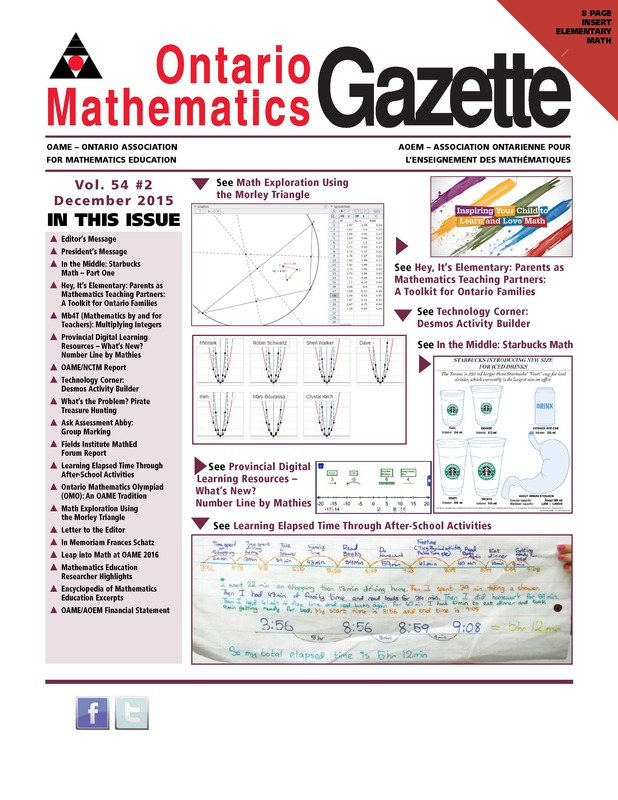 OAME Gazette Volume 54 Number 4 released including three articles, ten regular columns, the elementary school-focused Abacus insert, along with several special features. In their article entitled A Case for Humility in the Mathematics Classroom, co-authors Ilona Vashchyshyn, Heidi Neufeld, and Egan Chernoff discuss the three characteristics of humility (a secure, accepting identity; emotional resilience; and openness to new information), two related classroom vignettes, and a series of reflections on why and how this virtue should characterize effective mathematics teaching and learning contexts. Finally, in the first of a 2-part article, a retired teacher, pilot, and skydiver, André Lemaire, explores different mathematical methods for solving the ancient Greece classic “Three Spheres of Radii 3, 2, and 1 Mutually Tangent Problem,” including the use of Pythagoras’s Theorem, Heron’s Formula, trigonometry, Cartesian coordinates, and analytic geometry. Regular columns include the following highlights: OAME President, Tim Sibbald (his final President’s Message) discusses the NCTM Board of Directors meeting that was recently held in Toronto, which referenced the strengths of, and current challenges faced by, Ontario mathematics education; Todd Romiens (OAME/NCTM Report) highlights NCTM’s new Innov8 Conference designed to specifically help teachers engage struggling learners, and NCTM’s STEM Project (science, technology, engineering, mathematics) which continues to inform the American Congress; Lynda Colgan (Hey, It’s Elementary) discusses the Renewed Math Strategy with special emphasis on what she refers to as the “Lead Teacher dilemma”; Ross Isenegger, Agnes Grafton, Markus Wolski, and Greg Clarke (Provincial Digital Learning Resources) continue explaining the various applications of the mathies.ca Relational Rods resource (e.g., reasoning and proving, even/odd numbers, summing the natural numbers, partitions, and the ability to annotate within the software); and Mary Bourassa (Technology Corner) explores Nat Banting’s website “Fraction Talks” as well as sharing several examples of how others have used this helpful online resource in their mathematics teaching. Carly Ziniuk (In the Middle) presents an investigation entitled “Linear Leaping” in which linear relationships connected to healthy movement are examined by students using available data and a 4-part template which includes graphical, logical, numerical, and algebraic thinking; Assessment Abby (eponymous) focuses on linking assessment and instruction; Shawn Godin (What’s the Problem?) analyzes two rich problems involving card picking, probability, and the classic Monty Hall Problem with opened/closed doors and hidden prizes; Ann Kajander (MB4T) examines her fourth and final case involving division of integers, that of a positive divided by a negative number; and In the Abacus insert, co-editors Mary Lou Kestell and Kathy Kubota-Zarivnij complete their Volume 54 focus on relational thinking, here focusing on the operation of division. Volume 54 Issue 4 also includes several special features: (i) a David Davidson Tribute (1940–2016) written by his close friends Dean Murray and Jack Weiner; (ii) a Letter to the Editor by Tim Sibbald which raises awareness about a forthcoming publication and opportunities for participation; (iii) three further Ontario mathematics education researcher profile highlights; and, (iv) and some final excerpts from Lerman’s Encyclopedia of Mathematics Education (2014) regarding a variety of contemporary issues. It was my great pleasure to attend the NCTM “Building Bridges to Student Success” Conference 2016 in San Francisco, California, and to accept, on behalf of OAME, the Publication Award from NCTM President, Diane Briars, during the annual meeting of affiliate delegates. OAME Gazette Volume 54 Number 3 released including three articles, ten regular columns, the Abacus insert focusing on the elementary panel, along with several other special features. Betty Long and Deborah Crocker in their article, The Good Luck Paper Crane: Paper Folding and Mathematics Activities, provide directions for folding paper cranes, and ideas for mathematics activities using the paper cranes and children’s literature. Specifically, the authors highlight the touching story of Sadako Sasaki, the Japanese girl who was exposed to radiation from the atomic bomb dropped on Hiroshima during World War II, and who subsequently attempted to fold 1000 paper cranes in order to obtain her secret wish (Coerr, 2004). In Mathematics and Special Education: Two Teachers in One Classroom, Jacob Speijer, Connie Gray, Sandra Peirce, and Gail Doherty present the results of a board-wide professional learning project for which the primary aim was to leverage the complementary instructional strengths of the regular classroom teacher (RCT) and the special education resource teacher (SERT) within the classroom context. Anticipated benefits (reduced stigmatization, mathematics program integrity, increased opportunities for individual help, and greater differentiated instruction and assessment) and observed program results are discussed at length, as are recommendations for future implementation of similar programming, based on their co-teaching experiences. Meth Devendra, building upon one of his previous and related Gazette articles (exponential functions and tangents, V54N1), provides algebraic, geometric, and practical examples of Orthogonal Curves, i.e., the situation where the tangent lines to two curves at the point of intersection are perpendicular. Regular columns include the following highlights: OAME President, Tim Sibbald (President’s Message) discusses the numeracy–literacy connection, and draws attention to two new books by authors Roberts (re. Conway’s mathematical contributions) and Angus (re. Attawapiskat and social justice issues, including education); Todd Romiens (OAME/NCTM Report) addresses the controversy surrounding the American Common Core State Standards for Mathematics (CCSSM), specifically highlighting the mathematical content standards and mathematical practices (process standards); Shawn Godin (What’s the Problem?) explores the “nifty number 9” including finger multiplication; Assessment Abby (eponymous) focuses on assessment of the Mathematical Process expectations; and Markus Wolski, Agnes Grafton, Ross Isenegger, Greg Clarke, and Kathleen Corrigan (Provincial Digital Learning Resources) describe the “Whole and Relational Rods” tool designed to help students explore number concepts, develop reasoning for various operations, and foster proportional reasoning skills. Ann Kajander (MB4T) looks at teaching and learning strategies for introducing the first two of the four possible cases of dividing integers. Lynda Colgan (Hey, It’s Elementary) discusses rich tasks, big ideas, and a classroom activity in which students analyzed Northern Ontario bear family composition statistics as compared with those of humans; Mary Bourassa (Technology Corner) explores Number Talks, introducing two rich online resources created by Tranchmontagne (Number Talk Images) and Nguyen (Math Talk); and Carly Ziniuk (In the Middle) presents the second part of Starbucks’ Math in which she focuses on data analysis activities using technology. In the Abacus insert, co-editors Mary Lou Kestell and Kathy Kubota-Zarivnij continue their Volume 54 focus on relational thinking, here focusing on multiplication. 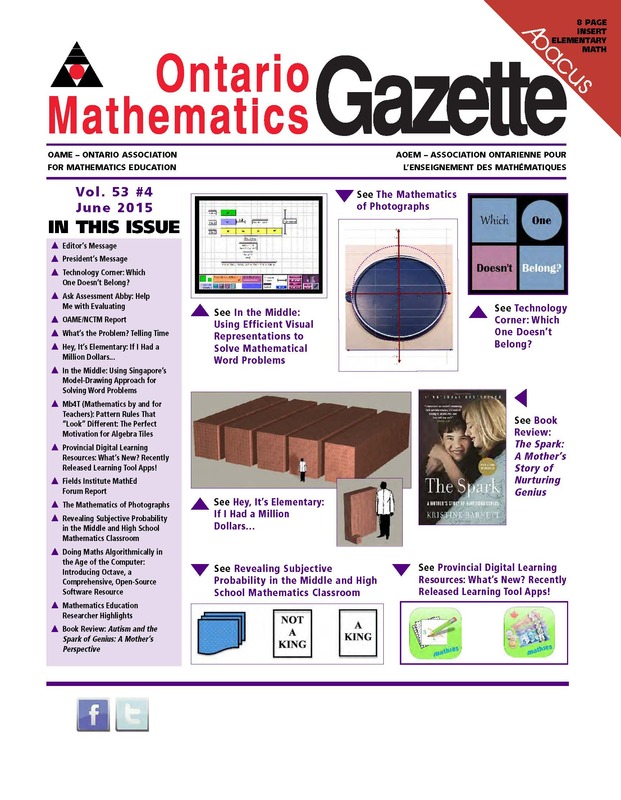 Volume 54 Issue 3 also includes several special features: (i) a letter to the editor by Louis Lim in which he pays personal tribute to the late Frances Schatz; (ii) a review of the 2-volume book set entitled Open Questions for the Three-Part Lesson: Number Sense and Numeration (2015) by author Marian Small; (iii) several Ontario mathematics education researcher profile highlights; and, (iv) further excerpts from Lerman’s Encyclopedia of Mathematics Education (2014) regarding a variety of contemporary math education issues. 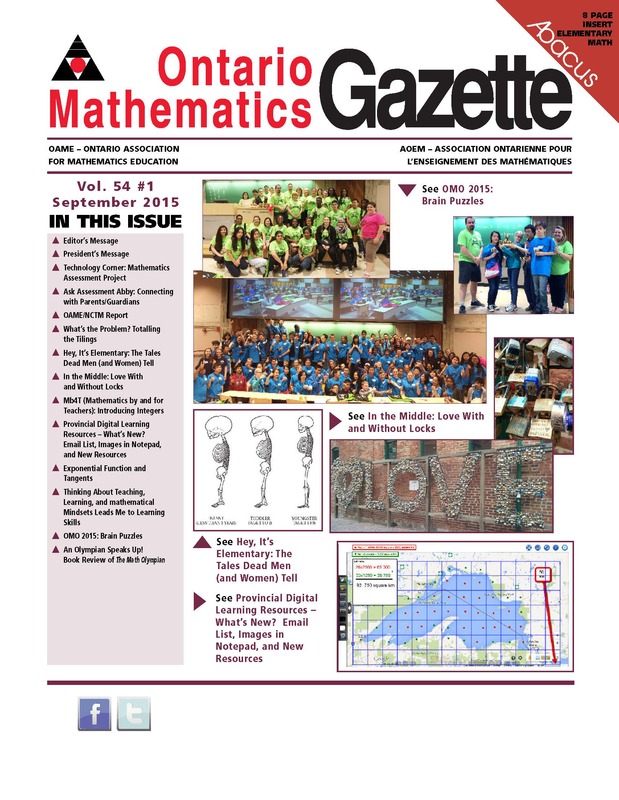 OAME Gazette Volume 54 Number 2 released and includes three articles, nine regular columns, the elementary school-focused Abacus insert, along with several other special features. In their article entitled Ontario Mathematics Olympiad (OMO): An OAME Tradition, authors Paul Alves and Judy Mendaglio (OAME Past-President and President Elect, respectively) reflect on the history of, and local OAME chapter approaches to, the annual provincial OMO competition. Tim Sibbald offers an extensive exploration of the Morley Triangle using GeoGebra software as a vehicle for algebraic, geometric, and numeric insights into the intriguing properties of this unique trigon. Learning Elapsed Time Through Afterschool Activities, co-authored by Miwa Takeuchi and Robin Coyle, presents the reader with an effective strategy for using number lines along with analysis of authentic lived experiences of students to reinforce the often perplexing measurement concepts related to time. Regular columns include the following highlights: OAME President, Tim Sibbald (President’s Message) discusses positive feedback, service opportunities, and a divisibility quirk; Assessment Abby (eponymous) focuses on group work assessment and parental/guardian involvement; Greg Clarke, Agnes Grafton, Ross Isenegger, and Markus Wolski (Provincial Digital Learning Resources) highlight their interactive Number Line by Mathies which allows students to represent numbers and to build deeper understandings of various operations; Mary Bourassa (Technology Corner) explores the Activity Builder feature in Desmos, which allows teachers to create investigations and visually track individualized student learning that may occur at different rates; and Carly Ziniuk (In the Middle) presents a math assignment focusing on Star Bucks’ new 916 mL cup size, the “Trenta” (reminds me of the 3L Coke bottles we witnessed in Ecuador last spring—mucho litros, amigos!). Todd Romiens (OAME/NCTM Report) explains the privileges and benefits of NCTM affiliation; Shawn Godin (What’s the Problem?) heads out in search of buried pirate treasure; Ann Kajander (MB4T) examines teaching strategies and tools relating to the multiplication of integers; and Lynda Colgan (Hey, It’s Elementary) showcases her new resource toolkit, Inspiring Your Child to Learn and Love Mathematics, through which she encourages parents/guardians to act as teaching partners in their child(ren)’s mathematical learning. In the Abacus insert, co-editors Mary Lou Kestell and Kathy Kubota-Zarivnij continue their Volume 54 focus on relational thinking, here focusing on subtraction. 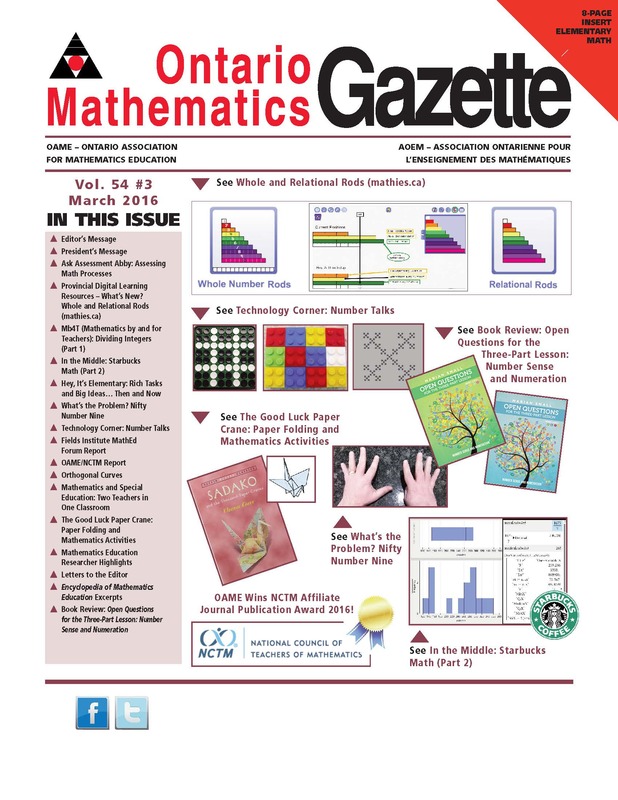 Volume 54 Issue 2 also includes several special features: (i) a letter to the editor by Tom Griffiths in response to the recent book review of Hoshino’s Math Olympian (2015); (ii) an overview of the upcoming OAME Annual Conference “Leap into Math” 2016 by co-chairs Victoria and Jim Baumgart; (iii) an obituary regarding the late Frances Schatz—former Abacus editor, NCTM Rep, and Gazette contributor—written by friend Jack Weiner; (iv) two Ontario mathematics education researcher profile highlights; and, (v) further excerpts from Lerman’s Encyclopedia of Mathematics Education (2014) regarding a variety of contemporary issues. OAME Gazette Volume 54 Number 1 released and includes four articles, nine regular columns, the Abacus insert, and several special features. In his article Thinking about Teaching, Learning, and Mathematical Mindsets Leads Me to Learning Skills, author Jamie Pyper discusses growth mindsets and habits of mind, and also highlights a learning skills rubric that he has developed for student assessment. OAME Past-President, Paul Alves, and co-author Judy Mendaglio provide the reader with details regarding the history and format of the Ontario Mathematics Olympiad (OMO). Further, they report on local branch traditions associated with the hosting of the OMO qualification events, as shared by member representatives at the OAME June board meeting. In terms of the most recent OMO 2015 competition, co-chairs Melissa Black and Linda LoFaro contribute a full report, including photos of the organizing team, candid student shots, and the winning student team. And finally, in Meth Devendra’s Exponential Function and Tangents, he demonstrates how a single common tangent line to two given functions can be achieved, using several distinct examples. Regular columns include the following highlights: OAME President, Tim Sibbald (President’s Message) shares his inaugural President’s Message; Assessment Abby (eponymous) answers a submitted question regarding teachers’ communication with parents/guardians; Mary Bourassa (Technology Corner) highlights the online resource known as the Mathematics Assessment Project (MAP); Carly Ziniuk (replacing Mirela Ciobanu as a guest columnist for the In the Middle column—thank you Mirela, and welcome aboard Carly!) presents a sample math investigation focusing on the Pont des Arts pedestrian bridge in Paris which has garnered international attention regarding the symbolic and controversial love padlocks placed on it’s side rails; and Greg Clarke, Agnes Grafton, Ross Isenegger, and Markus Wolski (Provincial Digital Learning Resources) discuss email list notifications, images in Notepad, partitioning sets tool, and wiki supports. Lynda Colgan (Hey, It’s Elementary) delves into forensic anthropology and how mathematics is used by experts to identify bone remains; Shawn Godin (What’s the Problem?) elaborates on the previous tiling problem and poses a new puzzle regarding buried pirate treasure; Ann Kajander (MB4T) looks at how to introduce students to integers; and Todd Romiens (OAME/NCTM Report) shares some ideas around stimulating a child’s curiosity and also how parents/guardians can be involved in their child’s math learning. As usual, this issue also features the rich contribution of ideas for elementary math teaching as found in the Abacus insert, co-edited by Mary Lou Kestell and Kathy Kubota-Zarivnij, and focusing here on equivalence and relational thinking. Volume 54 Issue 1 also includes several special features: (i) a review by Tim Sibbald of Richard Hoshino’s book, The Math Olympian (2015); (ii) two Ontario mathematics education researcher profile highlights; and, (iii) the remaining Canadian mathematics education researcher excerpts from within Lerman’s Encyclopedia of Mathematics Education (2014). OAME Gazette Volume 53 Number 4 released and includes three new articles and ten regular columns. In their co-authored work, Revealing Subjective Probability in the Middle and High School Mathematics Classroom, Egan Chernoff and Jack Chernoff contrast subjective probability with classical and frequentist probability foci. Using a deck of standard playing cards, they further share an innovative approach to the teaching and learning of a central tenet of subjective probability, for recommended use in the middle or high school mathematics classroom. In his article entitled The Mathematics of Photographs, Tim Sibbald builds upon his previous work (Mathematics of a Hill, 2014) and makes the case that sometimes modelling a physical object, seen in terms of the photographic image, can be useful for identifying patterns. Through the use of a number of intriguing geometric diagrams and photographs with grid/intercept overlays, Sibbald models his stated goal of providing a workable sense of how the taking of a photograph transforms the geometry of a physical object. Roger Herz-Fischler, in his article entitled Doing Maths Algorithmically in the Age of the Computer, introduces and advocates for the use of a comprehensive, open-source software known as Octave. He also makes the case for introducing high school students to an algorithmic approach to solving certain complex problems; and points out the perceived dichotomy existing in the Ontario Mathematics and Computer Science curricula. Through the analysis of a familiar “birthday problem,” Herz-Fischler describes the utility of the software Octave, and further offers a link to a free introductory resource. Regular columns include the following highlights: OAME President, Paul Alves (President’s Message) reflects fondly on his term as President; Assessment Abby (eponymous) answers a submitted question regarding the evaluation of curriculum expectations; Mary Bourassa (Technology Corner) highlights a new website entitled, Which One Doesn’t Belong, and created by Christopher Danielson; Mirela Ciobanu (In the Middle) looks at Singapore’s model-drawing approach for solving word problems using text, pictorial, and symbolic representations; Greg Clarke, Agnes Grafton, Ross Isenegger, and Markus Wolski (Provincial Digital Learning Resources) present and extol their two new web/mobile learning tool apps, Money and Notepad; Lynda Colgan (Hey, It’s Elementary) tackles large numbers such as billions, trillions, quadrillions, and…googolplexes [see also Richard Schwartz’s fantastic new book/website on a similar theme, Really Big Numbers (AMS, 2014)]; Stewart Craven (Fields Institute MathEd Forum Report) provides speaker highlights from the Saturday March 27th meeting; Shawn Godin (What’s the Problem?) poses a problem regarding telling time with two given hourglasses; Ann Kajander (MB4T) discusses student explorations of pattern rules using virtual algebra tiles; Todd Romiens (OAME/NCTM Report) discusses the teaching of mathematics to preschoolers; and, as usual, this issue also features the rich contribution of ideas for elementary math teaching as found in the Abacus insert, co-edited by Mary Lou Kestell and Kathy Kubota-Zarivnij, and focusing here on Spatial Reasoning via Patterning and Algebra and Data Management and Probability strand problems. Volume 53 Issue 4 also includes several special features: (i) a review by Tim Sibbald of Barnett’s inspiring documentary tale, The Spark: A Mother’s Story of Nurturing Genius, in which she recounts her autistic son’s incredible and ongoing journey through life and learning; (ii) several further entries of Ontario mathematics education researchers and their respective projects; and, (iii) selected excerpts of Canadian researcher contributions to Lerman’s new Encyclopedia of Mathematics Education (2014). 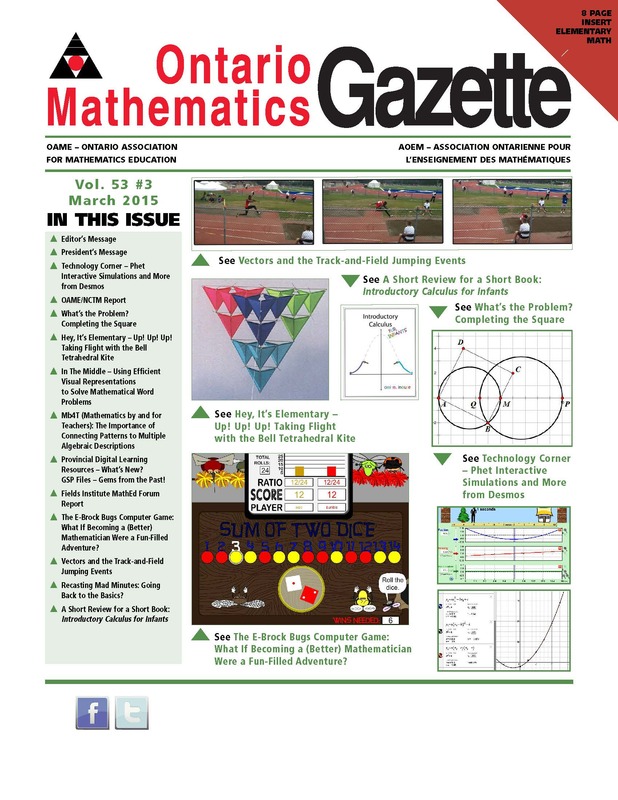 OAME Gazette Volume 53 Number 3 released and includes three new articles and nine regular columns, covering a number of exciting dimensions of mathematics content, teaching, and research. In Recasting Mad-Minutes: Going Back to the Basics?, Marc Husband and Tina Rapke share the results of a classroom-based research experiment, in which Grade 4 students were asked to complete “mad-minute” 1×2-digit multiplication questions, some (control group) using traditional algorithms, and others (treatment group) being encouraged to analyze the questions in terms of perceived difficulty level, to use a variety of previously encountered solution strategies as appropriate, and to generate and share their own set of similar questions and solutions with their peers. The results of pre- and post-tests written by each group are discussed, as are implications for teaching in light of the Ontario Curriculum. In their article, The E-Brock Bugs Computer Game: What If Becoming a (Better) Mathematician Was a Fun-Filled Adventure?, co-authors Laura Broley, Chantal Buteau, and Eric Muller lead us through a bug’s-eye view of the recently released (2013) digital version of an intriguing educational board game that was originally developed at Brock University back in the 1980s, and that has been successfully used to help elementary and secondary (MDM4U, in particular) students explore the major concepts of probability. Join narrator Bumble the Bee as she encounters helpful friends Bugzy and Smarty, as well as the evil gang of Mac, Bash, Fitz, Trickz, Crazee, Wicked, and the ultimate mastermind, “Dr. P,” and attempts to free the six districts of Bug City. A project website featuring the free game download, teacher resources, media coverage, and related publications is also shared. Finally, in Vectors and the Track and Field Jumping Events, author Patrick Russell explains how vectors (arrows that describe direction and magnitude of an object in motion) are applied in the various track-and-field jumping events: long jump, triple jump, high jump, and pole vault. Regular columns include the following highlights: OAME President, Paul Alves (President’s Message) introduces us to Daniel Kish, The Batman, and elaborates on the related importance of appropriately high teacher expectations, growth mindsets, and the fostering of challenging learning opportunities for our students; Todd Romiens (OAME/NCTM Report) discusses three NCTM websites—Illuminations, Figure This, and Reflections; Stewart Craven (Fields Institute Report) reports on the five speakers involved in the Annual Research Day (Jan. 31, 2015) of the MathEd Forum; Mary Bourassa (Technology Corner) highlights PhET interactive simulations, and revisits the open-source software, Desmos; Shawn Godin (What’s the Problem?) poses a problem regarding completing the square; Lynda Colgan (Hey, It’s Elementary) takes us up, up, up, and away with her detailed description of the history and construction of the Bell tetrahedral kite; Mirela Ciobanu (In the Middle) looks at using efficient visual representations to solve mathematical word problems; Ann Kajander (MB4T) explores the importance of connecting patterns to multiple algebraic descriptions; and Greg Clarke, Agnes Grafton, Ross Isenegger, and Markus Wolski (Provincial Digital Learning Resources) share some classic Geometer’s Sketchpad (GSP) files, and also provide us with an exciting update regarding their recently released Rekenrek app for desktop and mobile devices. As usual, this issue also features the rich contribution of ideas for elementary math teaching as found in the Abacus insert, co-edited by Mary Lou Kestell and Kathy Kubota-Zarivnij. 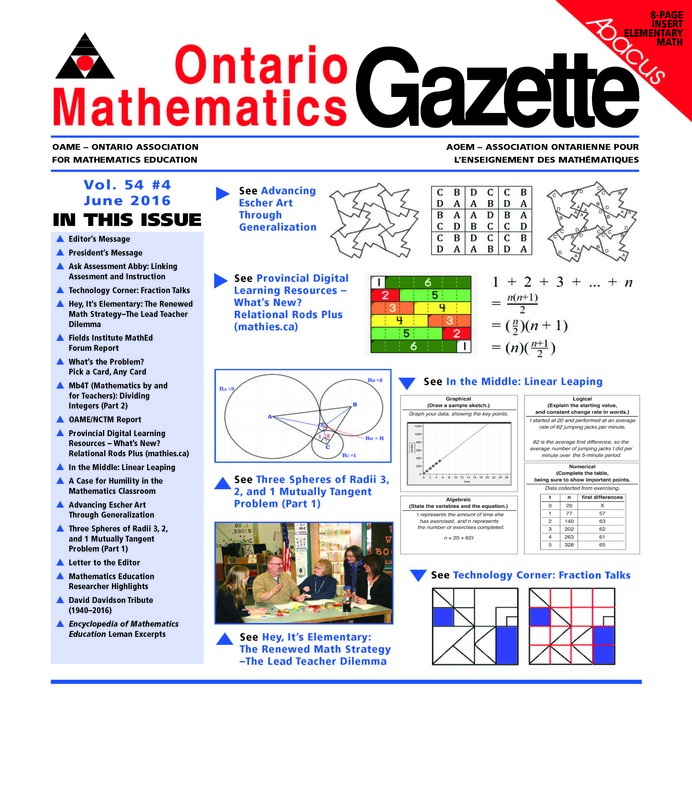 Volume 53 Issue 3 also includes two special features: a review by Tim Sibbald of Inouye’s creative new children’s book, Introductory Calculus for Infants (2011); and, the first instalment of a series of research spotlights focusing on current projects, as shared by Ontario mathematics education researchers. Zekeriya Karadag, Seyda Birni, Dragana Martinovic, Ozlem Deniz (Bayburt University, Turkey, and University of Windsor, Canada): Do they really learn mathematics in a visual, dynamic, and explorative manner?